It doesn't matter how efficient we make their engines or how many solar panels we install on their decks, the world's largest cargo ships—those water-bound leviathans on which international trade depends—will require massive amounts of fuel for the foreseeable future. However, this conceptual super-carrier could potentially save billions of barrels of petrol every year just by harnessing the wind. 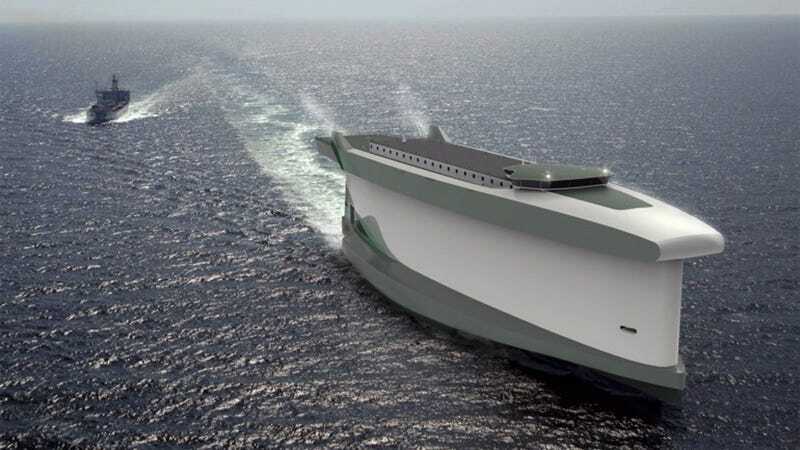 The Vindskip concept's design by Norway's Lade AS promises to cut fuel use by 60 percent and CO2 emissions by up to 80 percent thanks to an indicatively applied hull design. Engineers at the firm modeled the ship's hull after airfoils commonly found in aerospace design. This lifting body actually pulls the hull out of the water as liquefied natural gas-powered electrical generators propel the Vindskip forward. Just the wind created from its forward momentum—the ship's relative wind—is enough to help reduce the vessel's drag.